The initial data collection for the project has been finished. Our group was unable to blog or access the internet over the last week due to traveling in small towns throughout Ethiopia that don’t have internet. To catch up, we traveled from Gondar to Woreta where we conducted interviews before moving to Debre Tabor. It is crazy how different the climate can change here with a 40 minute drive. Woreta has a warm climate with temperatures probably averaging around 80 degrees. A 40 minute drive to the highland in the mountains and Debre Tabor was probably around 55-60 degrees. Luckily for me, this means I now have a cold. I am beginning to think I have a weak immune system, as I am always the only one to get sick. From Debre Tabor we met with Dr. Gebreyes, who brought a photographer and Dr. Sauvageau, a neurosurgeon from Ohio State. It was good to see others from Ohio. We drove to Bahir Dar which is the city that borders Lake Tana, the biggest lake in Ethiopia. Being a fishing connoisseur, it was very neat to see the traditional fishing methods. We celebrated finishing the data by going to a traditional Ethiopian club in which we saw many styles of “shoulder dancing.” I think I can dance better in Ethiopia than in the U.S. As long as you can move your shoulders to the music you can be accepted as a dancer here. People are less inclined to judge me on my overall lack of rhythm (or if they are judging me it is in Amharic and I can’t tell). 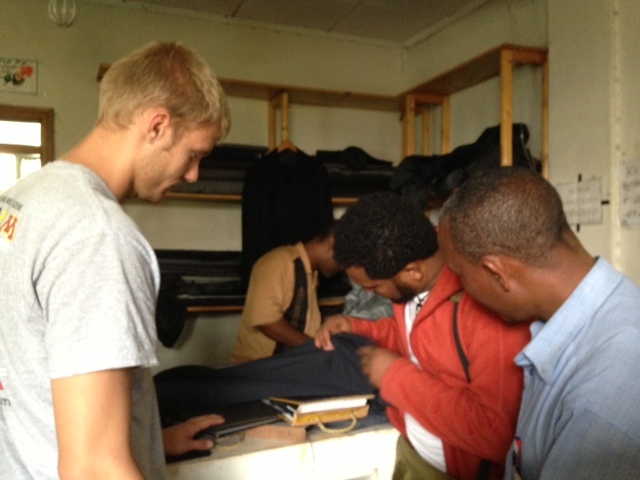 Once we returned to Gondar I was happy to pick up the suit that I had ordered in the city aweek ago. Since I am a rather tall, skinny, and lengthy individual, the suits already made did not fit me. Dr. Tamiru, a partner we have been working with, took me to his tailor who agreed to make me a suit from the cloth of my choosing for 1,900 birr. While that might seem like a lot in the U.S. that is equivalent to 100 USD. This is extremely inexpensive for a customized tailored suit. The suit fits excellently. In addition to completing the data collection, I have appreciated experiencing different aspects of the culture here in Ethiopia. Posted by omalley.44@osu.edu at 5:53pm Posted in Medicine, Public Health and tagged data collection, Eric Sauvageau, Ethiopia, Korbin Smith, Ohio State University, Student post. Bookmark the permalink.